The best way to stay ahead in the business world is to create easy to understand paperwork that keeps track of your credits and your debits. Receipts are essential for keeping track of your sales. A uniform set of receipts not only makes it easier for you to track your money, but also makes your business look more professional than handwritten receipts. Don’t waste your time creating your own receipt template. This great sales receipt template Word document is easy to understand, customizable and available for free right here. It is compatible with all versions of Microsoft Excel past 2003. It helps create a professional, polished style for your company that your customers will always remember. Start by filling in the company data information at the top of the form. 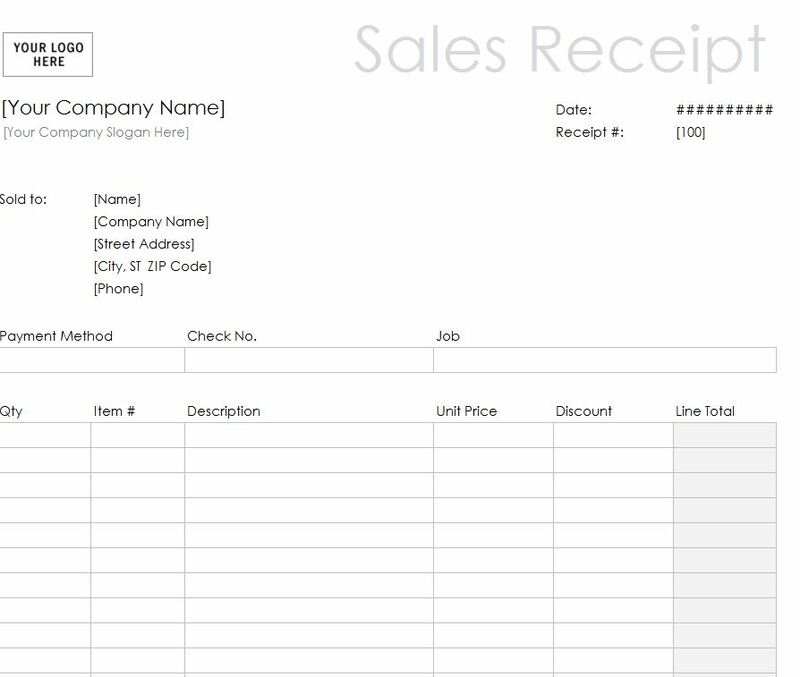 This information helps personalize your sales receipt template Word document to your own business. Add your address, phone numbers, e-mail, and any company slogan. A slogan or mission statement creates an instantly recognizable image for your brand. Next, add the information that is relevant to tracking your money. There are several available fields available. You are going to need to include subtotal sale, taxes, total price, extra services, the type of product, the amount purchased, and any other relevant information. Lastly, you’re going to need to include fields for customer information. Include name, address, contact information, and any other information that is relevant to your sale. You should also include a small area that indicates “customer” or “store” copy as well as a field for the date. This makes it easier to file and sort through your receipts later. Remember that your customer will be taking this sales receipt template word document home and may include it in their own records for tax purposes. Why not throw on a friendly greeting at the very end of the receipt? When your customer gets their receipt they will see it, appreciate it, and will doubly appreciate it later when doing their taxes. Next, make sure to print out your receipts on the highest quality paper. This makes them last a lot longer than they would otherwise. You should also make sure to scan your receipts and save them in an electronic form, just in case you lose any paper receipts.